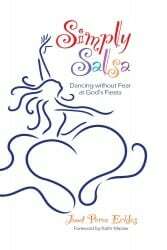 With a bit of sassiness, a touch of humor, and an amiga-to-amiga style, Simply Salsa encourages women to accept God’s call to dance! What keeps women from dancing to the freedom God offers? With passion and boldness, Simply Salsa exposes the lies and misconceptions that imprison women with unfounded insecurities and feelings of inadequacy. No matter the degree of adversity or pain, Janet Eckles has discovered an alternative to gloom—through the security that is only found in God’s love. With her own life experiences as testimony, Eckles will have you dancing! That’s right, we have forgotten to celebrate life. The reason is because we were misled in thinking that life is to be enjoyed only when troubles go away. But that’s incorrect. In Simply Salsa, I’ll show you how you can begin now to live that life that sings with joy, smiles with contentment, and dances with triumph. I’ll show you the secret. They say I should be the last one to dance—blind, endured marital infidelity, financial devastation, and the murder of my youngest son.I should be sobbing inside the well of pity. The reason I’m not is because of God’s grace. That’s the secret—His grace that showed me a better way, a simpler path and a deeper joy. But what explodes inside me is the passion to show you the same success, the same rich life and the same gift of freedom from fear, stress and worry. “Are you someone who longs for a deeper relationship with God? Are you reeling from the bruises of broken dreams, shattered goals, financial ruin, or strained family relationships?